As I wrote in my previous post we are leaving Thailand setting forth on new adventures. Australia, as always, calls me. Me and a dear friend of mine will touch down in Perth Sunday 31st of January. Plan is to be in Perth for a little bit, meet some of the Perth photogs, and then we will head South on a big South WA road trip hitting all those great spots down the coast and round the Southern part all the way to Esperance. Mission is: beach and coast everyday! 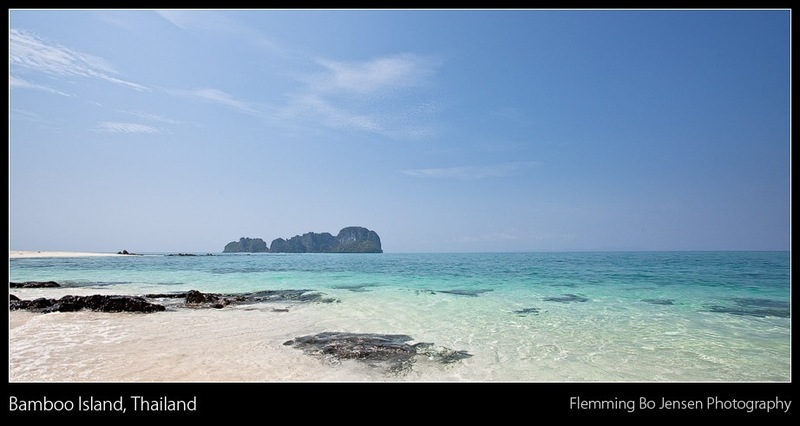 Really in need of some coastline after Chiang Mai and landscapes to shoot! 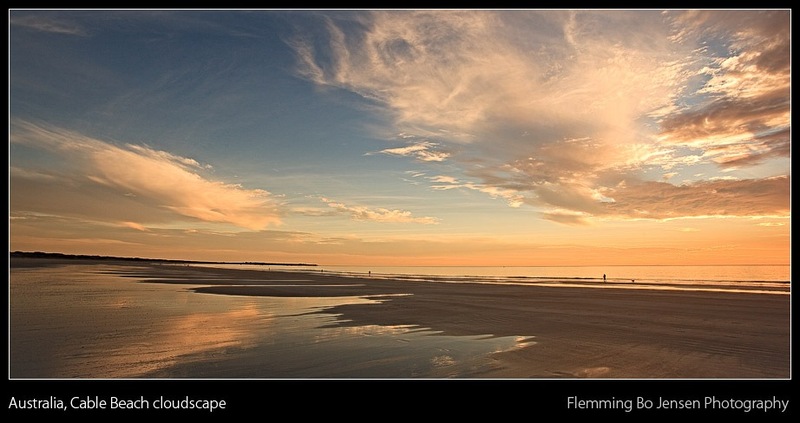 Great locations and beaches to visit going south from Perth all the way down and round the coastline. Recommendations? Accommodation along the way. Recommendations and help much appreciated. Feel free to comment or email me at mail(a)flemmingbojensen.com – thanks so much peeps, very much appreciated! Look forward to catching up with some of you and exploring the South WA. Later we shall hit Sydney as well, Sydneysiders be warned! 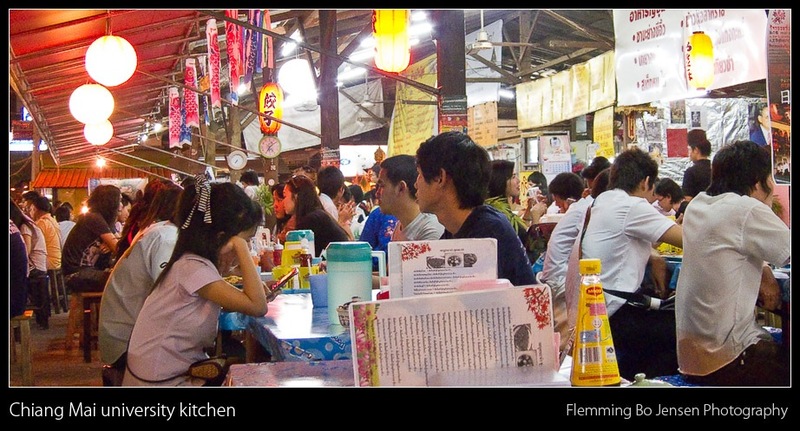 Just a few minutes walk from here, there is a large collection of food stalls under one large roof. We call them the Uni kitchens and they serve brilliant Thai food all day long for no money! Meals are all either 25 or 30 bath – around half a Euro, a quarter of a dollar, 4 Danish Kroner! For a full meal with free drinking water. We shall miss the Uni Kitchens very much now that we’re moving on! As I prepare to move on from Chiang Mai to Kuala Lumpur and then Australia I would like to share some observations with you. To be enjoyed with a healthy amount of sarcasm and irony! where the weather is just about perfect every day. Except there’s no coast and beach, nowhere to relax and enjoy this nice weather. where traffic is absolutely insane and it is perfectly normal to drive 3-4 people on one motorbike, Mum on the phone steering with one hand, 3 year old holding on to the handlebars – no one wearing helmets! where young people find it perfectly normal to wear weird furry hats in the form of a panda, mouse, tiger etc! where wild dogs roam the street wearing T-shirts! where noise is no issue. Thai’s do not notice it, are oblivious to it. I on the other hand want to find the off switch in my ears before I go insane. There is so much noise here. PA systems from hell. Traffic making your ears bleed. Disco in the ZOO. Jam bands killing my ears every night from every pub in the area. Outdoor concerts making me want to nuke the area! Noise always noise! Drives me absolutely insane. where you have a hard time walking anywhere. Sidewalks are not for walking. Thai’s do not walk. Sidewalk is for motorbikes to park on, for trees, for phone booths, traffic signs, anything but walking! where dried fish on a stick is considered a lovely snack. where NYE was one great outdoor party dancing in the street best ever! The Grinder. Always someone doing construction work. The Rooster. Not just at sunrise either. There is no number 6! Kings of Leon and Red Hot Chili Peppers Jam bands. Play every bloody night at the pub next to my condo. Chiang Mai. Love weather and food. Noise and traffic have driven me insane. Well more than I already was. Going to Australia. Full stop. Happy for end of Report khrap! I do apologise for being a bit slack on blogging! My first excuse is the very much less than excellent internet here in Thailand (terrible in other words). Second excuse is I spent the last 8 days in a bizarro world! Me and my friend spent 8 brilliant days on Koh Lanta, a tropical island outside of Krabi in the Andaman sea in Southern Thailand. It is an absolutely beautiful area of tropical islands, beaches and huge limestone cliffs. Boat rides here offer stunning views of islands such as Koh Phi Phi. It is a bizarro world however as everything is so constructed and fake, resorts, tourists, tour companies etc. Koh Phi Phi islands (of ‘The Beach’ fame) is now unfortunately one big backpacker hell of a tourist trap to be avoided at all cost! Koh Lanta was brilliant for sunbaking and swimming, beach was quiet and our resort was almost empty. The beach was useless for photography though, but a speedboat trip to Phi Phi offered a few quick and nice opportunities for some snapshots. This is a limestone cliff outside of one of the Phi Phi islands. It is a cropped 17mm shot from a boat so I added a bit of gaussian and motion blur to the water. The limestone cliffs are a spectacular sight but apart from that I fear the beaches of Australia have slightly spoiled me as Thailand does not quite compare in my eyes. However, being back in Chiang Mai I do miss the beach of Koh Lanta an awful lot! Avid readers of my blog know that my big love is landscapes, the amount of images I post with humans in them can be counted on…one finger I reckon! Some people consider any image without humans boring and the standard “there are no humans” is a too-well known statement. I always say it is merely whatever floats your boat photography wise. Some like macro insects, some like sports, some like portraits, some like landscapes! I have however always liked studying the good travel- and ethno-photographers and Laos gave me an opportunity to practice. 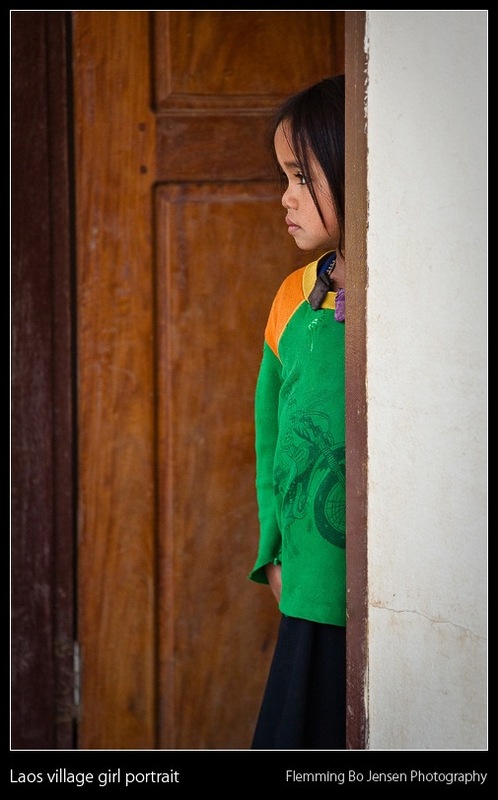 We visited extremely remote hmong hilltribe villages and schools for my friend’s research and here I had the chance to capture some of these gorgeous children. I shot hundreds of shots, mostly because the children were of course very interested (also slightly scared) of the camera and the magic lcd screen showing them an image or video of themselves. The boys were noticeably much more shy and of course being boys, playing it detached and cool, while the girls took to the camera quite fast. I present a couple of images that I shot after the first wauv factor had worn off allowing me to get some portraits where they were unaware of the camera. Meeting the children at the schools were a mindblowing experience. These are kids who live in remote villages, some of them had never seen white people before, they have nothing, they go to school but have no text books, no pencils etc. But they are incredibly strong and gorgeous survivors full of spirit, happiness and life. They have to be strong here to live, to survive. Given the right opportunities these tough strong kids can do absolutely anything as they are used to fighting for survival everyday. First is this gorgeous girl who absolutely loved the camera. She is not hmong, I forget the name of the tribe. She has an incredible face. I also attempted to catch the children playing with the amazing mountains of East Laos as backdrops. Some of these villages and schools enjoy views that are out of this world! 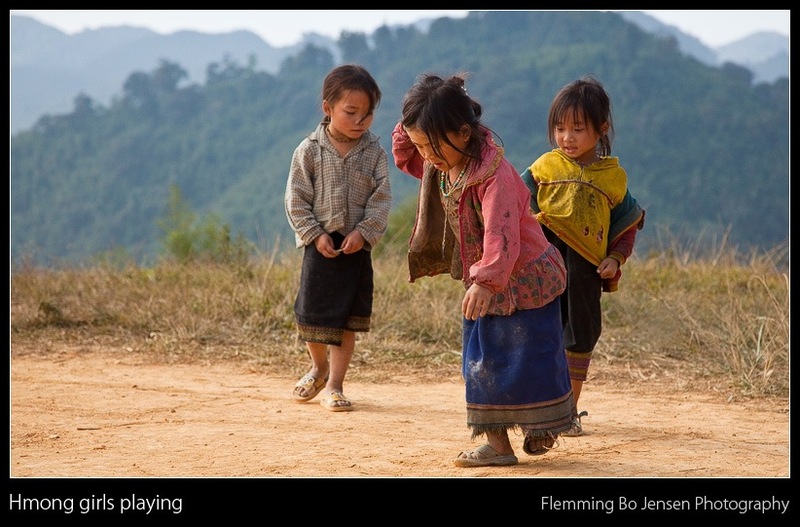 This is a couple of hmong girls playing. My primary love will always be wide open landscapes but I really enjoyed capturing these images. For this sort of work, the versatile 24-105mm Canon L lens proved very handy. I have much to learn and would like to hear your opinion on this little venture into ethno-photography.